If you’re looking for a book to support you through your fertility journey, then Making Friends with your Fertility written by specialist fertility counsellor Tracey Sainsbury along with co-author Sarah Rayner may be just what you’re looking for. 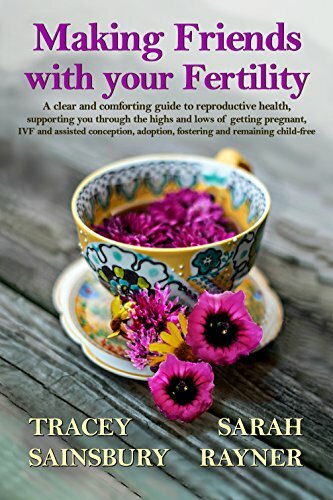 It contains all the basics you need to know about fertility and treatment but what’s so good about this book is that it is written by someone who really knows how it feels and who understands the difficulties you are likely to face along the way. I remember having lunch with Tracey some while back now when she told me she was thinking of writing a book. I knew right away that it would be the kind of book fertility patients would welcome, as Tracey is not just a fertility counsellor working in fertility clinics, she also has personal experience of fertility problems, and worked for the charity Fertility Network UK for years. She has known fertility patients as a peer, as a professional and as a support worker and she has a unique perspective on the journey. So many books about fertility are packed with advice about how to improve your chances of successful treatment through positive thinking. At one level, it may seem helpful to talk about relaxation but what I love about Making Friends with your Fertility is that Tracey appreciates that experiencing fertility problems and going through treatment can be traumatic, and that feeling stressed is a perfectly normal reaction to this. Tracey’s book won’t tell you to “just relax” or to “think yourself pregnant”, but will rather support you to stop blaming yourself for how you feel. I think Making Friends with your Fertility is a bit like having your own personal fertility counsellor at hand to turn to whenever you need support along the way. There’s a lot here about how you might feel emotionally and how to handle that – and it’s sensible advice. If you want a fertility book that is going to support you along the way, rather than set you impossible challenges, then Making Friends with your Fertility is one to recommend! This entry was posted in Advice and support and tagged fertility book, Fertility Counselling, Making Friends with your Fertility, Sarah Rayner, Tracey Sainsbury by fertilitymatters. Bookmark the permalink. Here’s a link to where you can purchase the book.